Within a span of 12 months, Boeing has gone from creating the concept design of its Passenger Air Vehicle (PAV) to the prototype's first test flight success. Boeing has tasted success with the first test flight of its autonomous Passenger Air Vehicle (PAV) prototype. The demo flight, which took place in Virginia, tested the prototype vehicle's autonomous functions and ground control systems as the vehicle managed to complete a controlled takeoff, hover and landing during its flight. 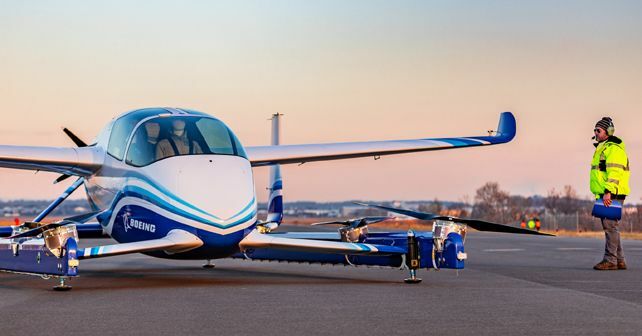 Boeing NeXt, which heads the company's urban air mobility efforts, took help from Aurora Flight Sciences (another subsidiary of Boeing) in order to develop the electric vertical takeoff and landing (eVTOL) aircraft prototype. As per Boeing, subsequent test flights will look at factors like forward wing-borne flight as well as the highly-challenging transition phase between vertical and forward-flight modes. 'In one year, we have progressed from conceptual design to a flying prototype,' said Boeing Chief Technology Officer Greg Hyslop. 'Boeing's expertise and innovation have been critical in developing aviation as the world's safest and most efficient form of transportation, and we will continue to lead with a safe, innovative and responsible approach to new mobility solutions,' he added. Powered by an electric propulsion system, the Boeing PAV prototype is designed for a fully-autonomous flight from takeoff to landing, with a range of approximately 80km. It measures 9.14 metres in length and 8.53m in width. While the PAV prototype test flight marks an early-stage success for Boeing NeXt, their urban air mobility portfolio doesn't just end here. In addition to the PAV, Boeing NeXt's future portfolio includes an unmanned fully-electric Cargo Air Vehicle (CAV), designed to transport payloads of up to 225kg. While the CAV has already completed its first indoor flight in 2018, Boeing will proceed to its outdoor flight testing sometime in 2019.